Several houses including a shop gutted following a fire broke out in Dokum colony on today evening. Several house in OBT complex at Dokum colony gutted following a devastating fire mishap this evening. 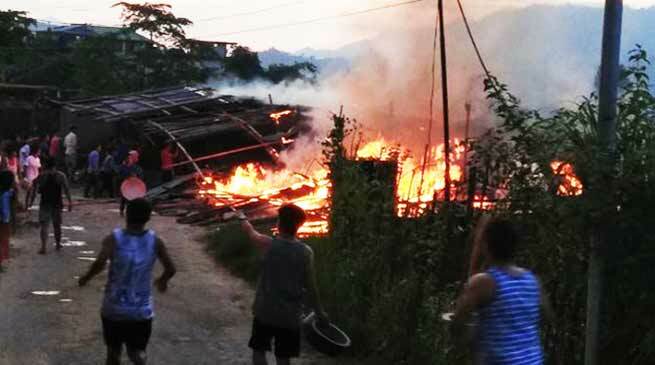 Itanagar Fire Station officer Koj Taro informed that today evening at around 5.40 through a phone call received of the incident two fire tender rushed to the spot and douse the fire from spreading into the locality. There was six apartment into an OBT complex which include a shop. The OBT campus belongs to one Tai Tasuk. All property were gutted in the mishap and the cause of the fire is yet to ascertain. Taro added.